With Mother’s Day but a few days away, I’ve read a number of posts featuring recipes for a variety of dishes, running the full gamut from savory to sweet. Not to take anything away from these beautiful posts, but I’ve chosen a different path. You see, so far I’ve shared a number of soup-related posts. Each was often described in terms of its use for members of my family. This soup nursed me back to health, that one nursed Sis; this was our New Year’s Day lunch, these took turns as lunch on cold Winter’s days; and, always, Dad was there to enjoy the salad Mom prepared using the boiled meats, similar to a bollito misto. Notice that Mom was never mentioned, other than as cook for these fantastic dishes. Sure, she enjoyed each soup but none were her favorite. No, Mom’s favorite, not so coincidentally, is today’s featured soup, split pea. As much as she enjoyed split pea soup, Mom rarely prepared it. If my memory is correct — something that becomes less likely with each passing day — Mom and I were the only ones to like this soup. The rest, at best, endured it. Not only that but we rarely had baked ham for dinner. As I’ve mentioned in previous posts, our holiday meals were pretty much decided and ham just didn’t make the cut. Besides, I don’t think that Dad was at all interested in baked ham, for I cannot remember it ever being served on a Sunday or any other night that Dad was home for dinner. So, with ham being served so rarely, there were no ham leftovers and, consequently, no split pea soup. I know my vegan and vegetarian friends will take issue with what I’m about to write but here it is. 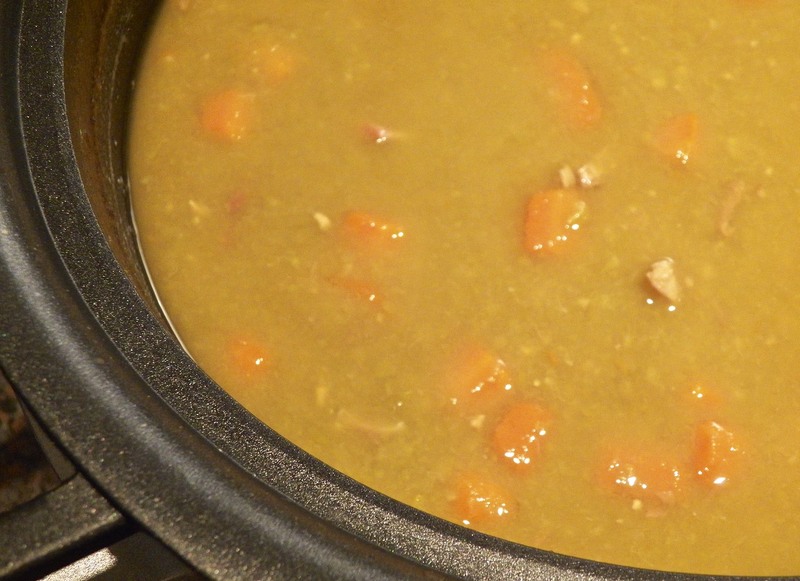 You must have ham to make good split pea soup. Mom said so. Though it’s true that we might not have had it often, Mom and I still did enjoy our split pea soup. She usually served it when it was just the two of us for lunch and it became something of a special treat. Later, after I moved away, whenever I told her that I was going to roast a ham — or had just done so — she would ask if I was going to make split pea soup, asking for each and every detail of the recipe. And more than once I brought a frozen ham bone home to Michigan with me, made a pot of split pea soup, and left it for her, safely stored in her freezer. So, this Sunday, while many will honor their Mom with a homemade breakfast in bed or a fantastic brunch at a favorite restaurant, I’ll remember mine with a bowl of split pea soup for lunch. Like so many of the recipes I post, today’s is a work in progress. Over the years it has evolved into a two-step process. In the first, a stock is prepared that becomes the base for the second step. It’s not at all complicated but it does take a bit more time than the standard way of preparing split pea soup. I think you’ll find, though, that the additional flavor in the soup is well worth the extra time required. Put all the stock’s ingredients into a large, heavy bottomed pot, bring to a boil, and then reduce to a low simmer. Continue simmer for 2 hours, skimming surface foam occasionally, as needed. After 2 hours, remove meat from pot and reserve. Pour stock through a fine mesh sieve to remove remaining vegetables and other bits, resulting in a clean stock. Reserve. When cool enough to handle, trim the meat from the bones and chop into bite-sized pieces. Cover and reserve. Add all the soup’s ingredients to a slow cooker. If you did not create enough stock in the previous step, add water to augment. Set on “low” and cook for 8 hours or set on “high” and cook for 4 hours. This can just as easily be made on the stove top as it can in a slow cooker. Create the stock as indicated and place all the ingredients into a stock pot rather than a slow cooker. Bring to a boil over a med-high heat and then reduce to a soft simmer. Soup will be ready once the peas are soft and the carrots cooked, about 30 to 45 minutes. If you want the smokey flavor but not the pork, try using a bit of smoked turkey instead of the ham hocks. From what I’ve seen, split peas are sold in 1 lb. (454 g) packages. When I made today’s soup, I made a “double batch” that resulted in a little over 4 quarts (3.8l) of soup. I wanted some for my dinner, to be sure, but also some for the freezer. As you may have already gathered, a bowl of split pea soup makes a fantastic lunch. Still, you can easily halve the recipe, if you like. You’ll note that I do not use salt and pepper until the very end. There’s no way to estimate the amount of salt in the ham or hocks. Wait until the end of the cooking process, give a taste, and then add whatever you feel is needed. Heat equal amounts of olive oil and butter in a frying pan over medium heat. Add 1 smashed clove of garlic and sauté. Meanwhile, cube a few slices of thickly sliced bread. When oil is hot and garlic fragrant, place bread cubes in the pan and toast, turning frequently. When browned to your satisfaction, remove to paper towels, and reserve. When I travel to Italy, there are 2 dishes that I request every time and very often more than once: pasta with clams and pasta with salmon. The first is a dish I’ve made for some time using a family recipe, while a recipe for the latter eluded me for years. You can well imagine my excitement when I finally stumbled upon the secret to this fantastic dish. Click HERE to see this secret revealed. This entry was posted in Family Recipes, Pasta/Rice/Soups (Primi Piatti), Slow Cooker and tagged Cooking, Food, Recipes, Soup by ChgoJohn. Bookmark the permalink. This is exactly how my Mom made split pea soup too! No crock pot in those days (that I know of), so it was stove top; she did soak the peas, in a crystal bowl that had been a wedding present; I can still see that bowl with peas on the counter (that would be a beautiful still life photo). I don’t recall how long she soaked the peas for, but from your recipe, it looks like I can skip that step. Thanks for the recipe and a wonderful memory; and what a wonderful tribute to your Mom for this Mother’s Day. Thanks, Angeline. I don’t recall Mom soaking her peas and I’m sure she would have told me to do so during one of our split pea soup-related talks. Yes, we did talk of it more often than one would think. She did love it so. 🙂 I’m glad today’s post brought to mind memories of your Mom, too. Not everybody enjoy this soep, (winter soep)John but the way you make it,its a amazing ….i found slim to wait with the salt and pepper. I understand, Massi. We are cooler here in Chicago and our Spring is just starting. As a result, our “soup season” lasts longer than yours. Thank you for commenting. Oh John. 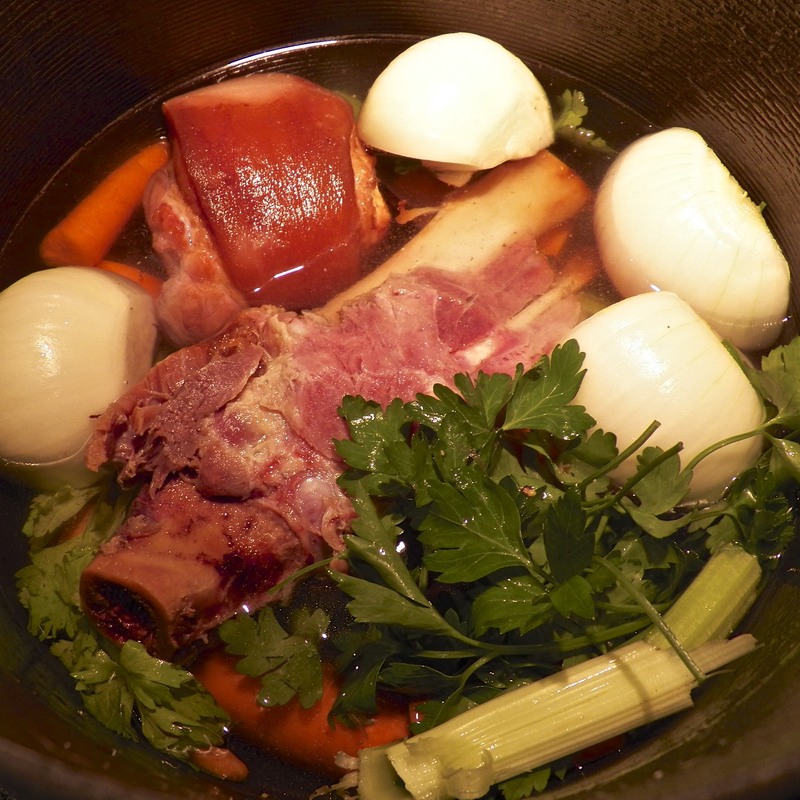 now you are showing me up for really lazy – yes, I use all the same ingredients, but mine has always been a one-stop-shop: I usually use ham hocks, but once they have come to a boil and been skimmed, everything else [+ a few secrets] just gets added and slowcooked for about half your time! Sloppy!! Also I oft use red lentils [guess from my childhood?] instead of split peas . . . SO, I am quite determined during the forthcoming winter to do it ‘your way’ and enjoy the difference! Oh, ‘wonton wrapper pastas’: bet Bobbi and I and others just can’t wait 😀 !!! Hello, Eha! I used to prepare this soup much like your one-stop-shop method but gradually came to this process — and I’m quite pleased with the results. We, too, make lentil soup, though with plain old brown lentils. I should post our family recipe one day. Next Fall perhaps. Our soup season is ending. Yay! I have found this soup to be so easy to make in the slow cooker and the left over ham gives it the perfect flavor. In Finland, split pea soup is served to the army conscripts every Thursday with oven raised pancake with jam for dessert. OMG: that happens across the Gulf of Finland in Estonia too 🙂 ! Sorry to be writing on the incorrect site, but: NO! We have an ‘Old Folks Home’ in the community here – they get the soup and pancakes every Tuesday methinks and begin the next day to wait for the following week 🙂 ! OK: it is not always split pea – oft it is sauerkraut soup or a meatball ort kidney one, but mostly pea/lentil they have had for oft 90 years 😀 ! I think this is the perfect tribute to your mother John, purely because this is her soup. We mothers are always busy cooking everyone else’s favourites that we forget about ours, so I decided that on Mothers Day, I will cook myself biryani because that’s what I love. Now, I make split pea with vegetable broth but add crispy bits of beef on top. To me it tastes good and I am certain yours is pretty fantastic too but I will never know how your split pea soup tastes like! Thank you, Nazneen. We kids never really know how much our mothers sacrificed for us. Being childless, I’ve even less of an idea than those with kids. I think it great that you’re going to prepare biryani for yourself on Mothers Day. Good for you! Another great post, John! I really like that you make a fresh stock. It is remarkable how similar this is to Dutch split pea soup. The main differences are the addition of celeriac and smoked pork sausage. Plus that in the preparation the stock is made while the soup is cooking (i.e. the ham hocks are cooked with the soup and at the end the meat is taken off the bones and added back to the soup). Here’s my recipe: http://stefangourmet.com/2012/01/23/classic-dutch-pea-soup-erwtensoep-snert/ There I used pork ribs, but ham hocks are more traditional. Thank you, Stefan, for leaving such a nice comment. At one time, I made my soup very much like yours, with the exception of a few ingredients. I’ve found this way to be much easier — and less messy — to remove the meat from the bones and then trim it. Plus, I can add more flavors to the soup because those stewing vegetables will be separated once the stock is made. You are right that the Dutch method is messy. There are peas sticking to the meat that you are deboning. Oh, EllaDee. Yours is a family after my own heart! I bet your soup is a delicious experience and something well-suited for the cold Estonian Winters. I bet when you make it now, it is quite the nostalgic experience. How nice is that? I only make a ham once a year so I only make split pea soup once a year. I really have to change this for I do so enjoy this soup. there are 2 soups I hold up there as my favorites, one is lentil soup and the other obviously split pea soup, I wish I had a nice story as a backdrop, but nobody in my family liked it starting with my mom hahaha, it will be years until I stopped eating it out of a can and making it myself. Ham bones, bacon, definitely in my preparations, I really like your recipe too, I love how straight forward it is. I usually use the pressure cooker (both to render the stock and to cook the peas) and I finish with a splash of heavy cream, I guess I’ve lived in the US long enough, I like the creaminess. I’m curios about this slow cooker approach, I don’t own one, but i can see the benefits. Again, lovely post, thank you John! Thanks, Susan. I tried the vegetarian lifestyle and just couldn’t go without meat. Then, too, it was some 20+ years ago and the food choices available today for vegetarians/vegans weren’t even dreamt about back then. I was going to add my split pea soup recipe from back then but couldn’t find the recipe. As I recall, tamari was used to simulate the meat flavor but after 20+ years I could easily have that wrong. I feel honored that you’d send the link to your Father. Thanks. I hope he likes it. A lovely tribute for Mothers day John. Plus a recipe that we can all share with you. I agree with your mother 100%. I always make a single batch just for the 2 of us and there’s never anything left in the pot. This looks really good. It’s getting winter here and it’s nearly time for some pea soup. 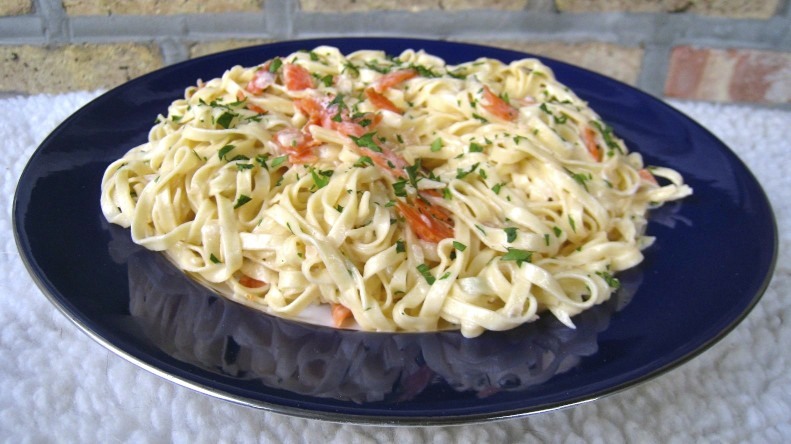 That salmon pasta was my all-time favourite when pasta was a staple in my world! That is, until I ordered it in what I thought was an Italian restaurant (NOT) years and years ago; they used processed yellow cheese as the sauce. Really Disgusting. I nearly hurled right there. I couldn’t send it back because we were guests and it would have been rude, so I suffered through it, but rest assured we NEVER went back. Your blog always tempts me beyond comprehension to make the dish and the salmone with vodka is definitely up there on the list. $40 is average pricing for vodka in Ontario! Thank you, Eva, for your gracious comments. Yes, Mom was grateful for the ham bone and really did enjoy the soup. That was nothing, however, compared to the amount of goodies that she packed for me to take home. Now that was something! Ah yes, the ‘doggy bag’. I must admit to having that gene too; every time my single nephew is over I want to pack a take away for him but JT stops me. It must be the European woman’s gene! I can just imagine how lovely it was getting home and unpacking your Mom’s delights and enjoying them. When I was 19, I convinced my Mom to go to Hungary with me (it was supposed to be just me, but I chickened out) and on our way home we had a night stop over in Copenhagen; my aunt packed sandwiches and both Mom and I thought she was nuts. When we arrived at our layover hotel, in the middle of nowhere near the airport, we were so grateful for the very tasty food (plus Copenhagen was really expensive in those days). I would’ve loved this back in January and all during the cold winter months, but better late than never. This is one of my favorite soups. That’s a wonderful way to remember your Mom – enjoy it and the memories on Sunday! Thanks, Dave. A drizzle of vinegar? I like the sound of that and will have to try it when I pull that last quart out of the freezer. Thanks for the idea. now, the ham bone, that is non-negotiable of course! Sorry, vegetarians, it’s part of this deal for sure! John, though I won’t eat no ham bones, no how 😉 I respect and appreciate so much what you’ve chosen as a way to celebrate your mom! I think that whatever way we decide to do that, it all begins with Knowing her. It’s not about a greeting card that sings Swanee, How i Love ya, or two dozen red roses and a box of chocolates; it’s not one of the million, as advertised, “perfect gifts for Mom” – its knowing the heart of the woman who loved you in those so many ways that mothers do. Having read along for a year and a half now, it’s clear: you know (and probably have) the heart of your good mom! Way to speak love in a soup, John! May this be a day for you of happy remembrance! Wow, Spree! Saying that I probably have the heart of Mom is one of the nicest comments left on this blog. Thanks you so much. No matter how old we get, to some degree we all try to live up to our Mom’s example. She did love this soup, though, and it was a pleasure to make a potful for her. I made a few kinds for her but split pea was by far her favorite. I hope you have a lovely Mothers Day, Spree, and that someone says something to you today that more than repays you for the kindness you showed me here. What a beautiful tribute to your mother John! I love that this is made in the slow cooker, cooked with love. A wonderful winter warmer. I guess ham isn’t big amongst the Italian community. I remember having it only once in my childhood, when my mom made it with pineapple slices sitting on top and glazed cherries in the middle. I remember everyone was astounded at this dish, and then we never had it again! My dad became the cook of our household after my mom passed away and although he LOVED split peas soup, he never baked a ham therefore he never made this favourite soup of his. He ate the store-bought kind. I love that picture of your soup with croutons, looks Oh! so good!! And how wonderful that you are honouring your mom’s memory with her favourite soup!! I absolutely love this. Such a touching tribute. I’m including these ingredients on my next grocery trip as I can’t wait to try my hand at this. For some reason, I’ve never made it, but your pictures and enthusiasm have it at the top of my list. I really appreciate all the informative instructions along the way, too… ‘cuz one, I don’t want to screw it up… and two, I want exactly what you have in that picture!! It looks amazing. Thanks so much and have a Happy Mother’s Day… You certainly deserve it! I really love split pea soup! I hate to admit that usually eat the canned variety, mainly because my entire family turns their noses at the thought. I can’t understand it. I think this is a wonderful soup to make in honor of your mom, John! Hi John Pea and ham soup is my absolute favourite. I make it several times every winter. I make mine just like my mum used to. It is a lovely way to remember them. i had an air fryer and oven that i’ve bought 1 year ago, that thing is got 1600 watt to work and i’ve got only 1300 watt…. Good one, Dedy. Lately I’ve given some of my rarely used gadgets away. They were just taking up space. Hi, John. Another fine recipe here. I love split pea soup. Sadly, I am the only one who does. 😦 As such, it never gets made but if I go out to eat and it’s on the menu, I always get a bowl. This one looks great and the homemade stock makes all the difference in the world when it comes to soup. Great Job. Thank you, Richard, for your kind comments and you’re certainly not alone. I’m a bit surprised to see just how many households have but one split pea soup lover. Who knew? Sacrifice…thy name is Mother. Your post brought a slight little lump to my throat – my Mother never, ever, cooks anything that she alone likes. I don’t think I even know if there is one thing that she loves to eat that no one else likes. I am pretty sure she would not have anything on top of her head if I were to ask her right now. And I must ask it. Today. It’s only fitting that I do that. I have had split pea soup a couple of times, and I can’t say I am a big fan, but this version sounds so alluring, could be because I love ham. Bookmarking this, I must try it. Thanks for posting this beautiful post John. You and I share that “ham love” and it really does make split pea soup something special. I hopeyu do give it another try and like it this time around. Good luck! Split pea soup is great! I always make a big batch and freeze whatever we don’t eat. It thaws and reheats beautifully. I often (not always) make mine by making a ham stock the way you do, too, and the results are spectacular. I don’t usually have a ham bone, alas, so typically I make my soup with smoked ham shanks or hocks. A pretty good substitute. There’s also ham base in the soup aisle of your supermarket that’s not half bad – worthy checking out. Really excellent recipe and post, and a great way to remember your mom! Thanks for a great post. Thanks, John, for leaving such a nice comment. I’ve seen that ham base and never thought to use it here. Talk about a disconnect! A number of years ago, I started using smoked turkey wings to make stock for Thanksgiving. The following Spring, I gave smoked hocks a try in my split pea. I’ve used both ever since. They do bring a lof of flavor to both stocks. Mmmmh! It looks super good! And there are no vegetarians in our house so we might try it soon! I think it great that you and John each have your own dishes to prepare. No matter how much a person likes to cook, it is nice to have a day off occasionally. My tomatoes need help! I’m pleased that the couple cherry bomb pepper plants are doing well, though. Once the cold wave passes this weekend, everything is going outdoors. I’ll see how things go from there. Thank you, Judy. You’re right about food binding us together. I really hadn’t noticed it until I started this blog. Now I see the role that food played in our lives. It’s really something! I think homemade soup (with frozen leftovers!) is one of the best gifts anyone could get. And I agree with your Mom, you need the smoky savoriness of the ham & bones to give depth to your split peas. There are lots of amazing vegetarian/vegan soups out there but not this one 🙂 I wish my butcher had ham hocks, I’ll just have to settle for tasso. Drool. While I am not a fan of the pea (in anything – I even request it left off pasta dishes at restaurants), my Grandpa would have absolutely loved your recipe. He too was a big fan of split pea soup. Whenever my Grandma, then mom or aunts would make a ham, they would reserve the bone so that they could make split pea soup for Grandpa. Makes me think of him every time I see it or hear it. 🙂 Here’s to your mom (and Zia too) on this Mother’s Day. They have both (and of course you as well) made my kitchen a more delicious place. Well, Kristy, if you don’t like peas, I’m afraid this post is not for you. I am glad, however, that it reminded you of your Grandpa. Thoughts of Grandparents are always good. 🙂 That was a very kind thing to say about Mom & Zia. Thank you so much, Kristy. Thank you. We all enjoy it. Beautiful tribute to your Mom, a very touching post. Love split soup but have not made it for a while, should remedy this. Soup is good anytime, even in summer and especially when it is already in my freezer. Like your 2 steps idea. I do this with other soups by never thought of this with split pea soup. Looking forward to your “wonton wrapper pastas”. Thank you, Norma. Isn’t split pea a great soup? I really do enjoy it. You had asked me about using eggroll wrappers to make cannelloni. I’ve never used them because they are so large. 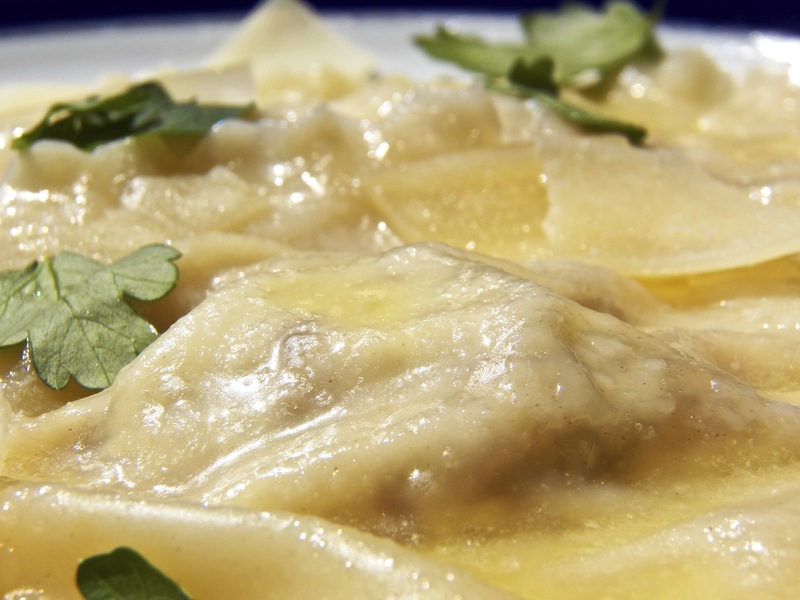 I did use wonton wrappers, though, and that’s what’s in next week’s post. I’ll have you making ravioli in no time! I’ll be sure to give her Zia regards when we talk this weekend. One of her sons and his family will be visiting her. It certainly surprises her to see so many people from all ’round the country and world sending her well-wishes. Heck! I’m surprised. When I first started this blog, she and I talked about how popular it would become and never did we think anyone but a few family members would be interested. This is utterly amazing! Hi John, I love the storytelling, so deep set in your tight knit family life. Nice soup too! Thank you, Conor. I’m glad you enjoyed the post. John, what a wonderful son you are. And what a good split pea soup. As a child I hated soup. I think because my mom never made this. I have made it with ham hocks but it has been a long while as I don’t like shredding or taking the meat off the hock. It gives such good flavor and we never have ham, so no ham bone. And today is a day for soup as it is cold and pouring rain. I best see what is left here as I really don’t want to go to the grocery. Thanks for the tribute to your mom. It brought a tear(s) to my eye. Aw, Abbe. That’s very sweet of you and I’m touched. Thank you. Quite a few years ago, I “went vegetarian” for a while. During that time, I had a vegetarian version of split pea soup that used tamari, I think, among other things, for flavoring. I have to admit it was pretty good. Problem is that I’ve searched high and low for that recipe and couldn’t find it. I wanted to include it in today’s post for people who wanted to avoid ham or meat altogether. If I find it, I will post it. I hope you have a wonderful Mothers Day, Abbe, surrounded by all whom you hold dear. CJ, add me to the list of people who absolutely adore split pea soup. It’s right up there at the top of my list with butternut squash soup. Some friends and I actually had a pea soup cook-off a few years ago. If only I had this recipe then, I would be the Pea Queen. Plus, I lost to a guy! A few years ago? It’s time you challenged him to defend his crown. There can only be one Pea Queen and that title has you all over it, Toni.Go get him and that crown! John, i am sorry for your loss, please accept my condolences… But you are right, your mom lives through your work – i really felt her presence and warmth among the lines of your entry. I am looking forward to learning more about zia Lea and her culinary magic! That’s such a nice thing to say. Thank you so much for your kindness. I love split pea soup. I started eating it when I moved to New York and I fell in love in a instant. I have to admit I have never made it. Your recipe sounds wonderful. Ham stock? This is a first for me and it’s simply great. Thank you, John. Thank you, Francesca. 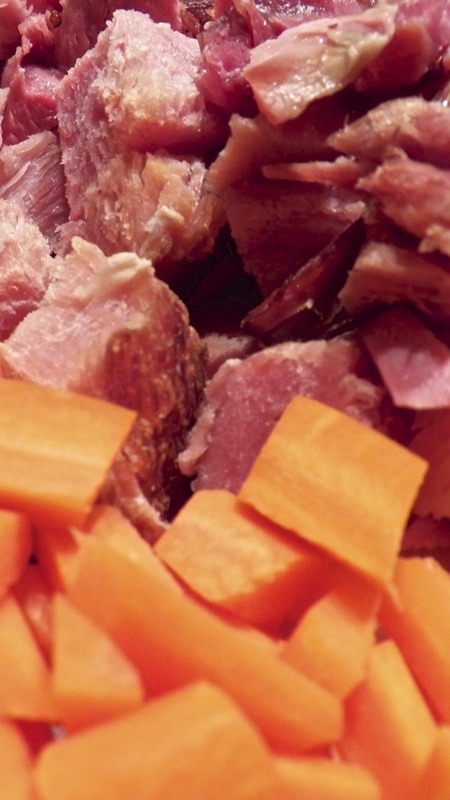 I used to just throw the ham bone, pig hock, split peas, sliced carrots, and water into a pot, simmer it for about 30 to 45 minutes, clean the meat off the bones, and serve. Well, what a mess and there was little depth to the flavors. Making your own stock first gives you the opportunity to add onion, celery, and whatever flavors you want and create a ham stock. The split pea soup that results is a much better tasting soup. I hope you give it a try. You’re so kind, Anne. Thank you. I had this for lunch today! My favourite soup of all, with those big chunks of smokey ham. Lovely story, too! Thanks, Sam. I’d no idea that split pea soup was so popular. And, yes. It just has to have chunks of ham! Thank you, Stefano. Isn”t it amazing how some foods bring to mind so many memories of our youth? It seems like every soup from my childhood has its own memories associated with it. Aren’t you the kind one! Thank you so much. Have a great weekend and thanks for taking the time to visit and comment. Mmmmmmmmmmm!! Now what wine goes with this great soup? I don’t think I’ve ever had wine with split pea but I bet a nice Rosé would work well. 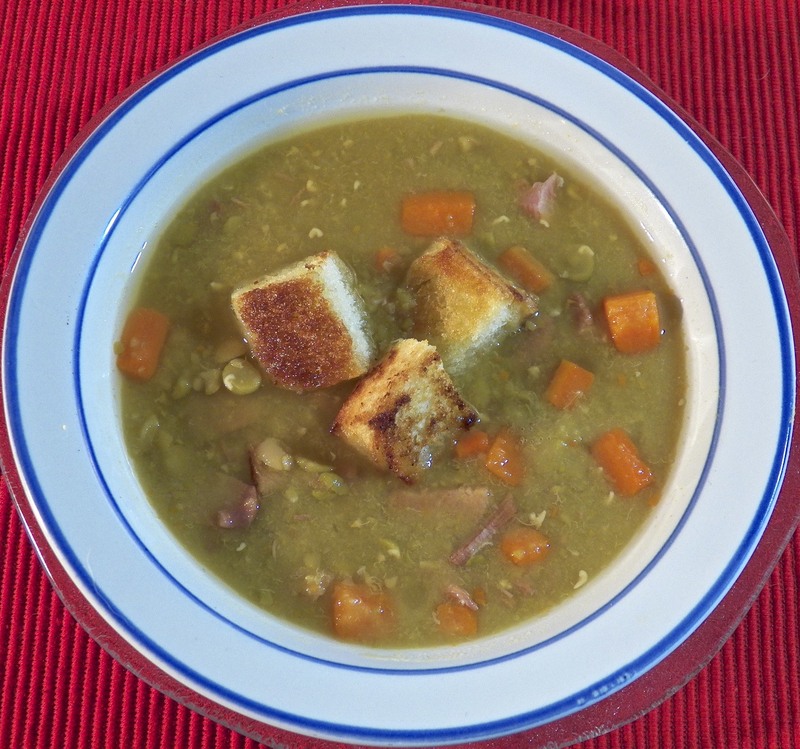 My husband and I both love split pea soup and your recipe is special with the added ham hocks. Thanks, Karen. Those hocks do add a nice smoky element to the dish. The image of you eating split pea soup this Sunday in tribute to your mother is just so touching; how you must miss her, yet clearly your connection is still strong and present. Your split pea soup looks and sounds delicious. This is one of my favourite soups. My recipe for it is somewhat simpler; I ‘cheat’ and use a smoked pork chop in place of the ham hock. That works for me as I’m not a huge fan of ham (sacrilege I know, when it comes to split pea soup). You’ve given me a great idea; I think I’ll bake a big batch and freeze portions to take with us to the cottage this summer. After a day on the beach, once the sun goes down and the air cools a hearty bowl of this would be so good. Soups like this aren’t just for winter even though that’s the normal association for me. I really must send the Culinary Enthusiast over in the boat to pick you and Zia up. It sits three quite snugly, but that’s got to be more comfortable than swimming all that distance! I hope you have a wonderful Mothers Day, even if it isn’t celebrated in Hong Kong. I love soup, I love split pea soup and I love split pea soup made with a ham bone even more! This is one of the first soups that I ever made from scratch when I was about 12 or 13 years old. When I was a kid I had this soup at a friends house for the first time, and was in awe at what a ham bone could do in a soup. I went home and tried to make it myself and umm well I wasn’t as diligent about stirring then as I am now and I ended up with a burned bottom pot of split pea soup! I fondly remember this though and you must have read my mind because I just bought a bag of split peas the other day with the intention of making a pot of it this weekend! I was going to make it vegetarian as I usually do (since my husband is a vegetarian) but for Mother’s Day I will get a ham bone to throw in for sure! Thanks for the inspiration, again. I hope you have a wonderful Mothers Day and a fantastic bowl of soup! John, pea soup is at the top of my list of soups. I do a similar version but will try this when the clouds move in again. We’re back in the cold again, Susie. Highs in the low 50’s but overnight lows in the 30’s. It’s still split pea soup weather here! Oh boy are you bringing back memories for me now. I have only eaten my mother’s pea soup & never got the recipe from her but this looks & sounds just like the way she made it. I know exactly what I’m going to do with the next ham bone – of course i’m going to have a very disappointed dog but Lola’s going to have to wait. Hello, Maria! I’m well and hope you can say the same! I’m glad you stopped by and enjoyed today’s recipe. Have a wonderful Mothers Day. I hope you’ll be surrounded by your family. This is perfect for Mother’s Day. Delicious, comforting, reminds me of the days when I get so excited as my mom cook her special soups. Soups that warms the heart like no other. That’s it exactly! Moms and soup go together like nothing else. I hope your Wife had a lovely Mothers Day. This is close to the Dutch ‘erwtensoep’ I love this soup. I ate so much split-pea-soup when I was a student in the Netherlands, during winter. I generally love soup. I haven’t come across one that I don’t like. I am feeling hungry now, I haven’t had my breakfast! Have a wonderful weekend and thanks for stopping by. I’ve a Dutch blogging buddy and he mentioned the similarity between our soups. It’s not surprising when you’re dealing with flavors that go so well together. The real surprise is that it isn’t more widespread. Thanks for visiting! The ham stock really makes this. What a nice soup and a nice post. Thanks, Greg. Pork-based stock. What a concept! I liked that you added carrots. Do you ever add potatoes, or is that too weird? Thank you. I’m glad you liked the post enough to not just try it but to possibly recommend it, too. I’ve never included potatoes in this soup. It’s pretty thick already and the starch from the potatoes might make it even thicker, especially if they began to break down. Whether or not you include potatoes, please let me know how you liked it. I’m always open to suggestions. My favorite soup ever and a childhood comfort! We were cut from the same cloth! Thanks for dropping in and taking the time to comment. I’m with you, Celia. I never know when the next hambone is going to come my way. So, I make a big batch, freeze it, and have some fantastic lunches in the weeks to follow. You are so welcome, Marina. I bet your soup is every bit as good as this one I think your Grandmother’s methodology probably comes from the days of wood burning stoves. Once the bread was baked, there was still enough heat in the ashes for a long and slow simmer, just what this soup needs. I bet that soup of hers would far outshine my attempt here. John I would definitely make a large batch of this soup, although I’ve never tried it with 2 lbs of split peas — wow! I’m afraid to say that the girls never seem to tire of this soup (I’m knocking on a piece of wood right now) and I like it too. Your version looks delicious and I particularly like the idea of adding the croutons. Yum! Hi John, this is such a hearty and delicious looking soup. I love adding croutons into soup, I wish I’m having a bowl right now! Oh yum split pea soup…. have to remind my mother that it is still one of my favourites!!! You’re speaking my language with this recipe John. One of my most favourite soups! I like the smoked turkey suggestion. I love that your mum made the soup as a special treat, just for the two of you. What a lovely mum – this must be an especially poignant meal for you. Thanks for sharing the recipe. Thanks and you’re right, Saskia. This is a special soup and meal, and comes with many memories. I’m surprised by how many others feel the same way about it. I love all kinds of soup. Never had home made split pea soup. Yours looks wonderful, must give it a try next time I have ham left over. Thanks for sharing. What a fantastic, tasty, and hearty soup! Thank you, Amber. It really is a favorite and even though more of a cool weather soup, I’ll eat it year-round. No problem! I really feel honored when you reblog one of my recipes. Thank you. You are so welcome, I feel so honored to be able to follow your beautiful blog and that you are sharing such fantastic memories and recipes. I am attempting to try the same but no where near your level. What you have done is so inspiring and so I am the one that is thankful to you.